Hogan Threatens Veto For "Protect Our Schools Act"
UPDATE: The Governor was true to his promised and vetoed this bad bill, unfortunately the House of Delegates and the Senate voted to override the veto and the bill will become law on July 1. Gov. Larry Hogan on Friday blasted an education reform bill that’s moving through the General Assembly that he called disastrous and irresponsible. To “protect” Maryland’s schools against what they call the “Trump/Devos Privatization Agenda”, the Democratic majority in the General Assembly passed HB 978 – Protect Our Schools Act of 2017 – a bill pushed by the state teacher’s union that weakens accountability standards and creates barriers for the state to intervene in failing schools. Under the federal Every Student Succeeds Act (ESSA), the State Board of Education will be devising a new accountability system for school performance. HB 978 ties the hands of the State Board and dictates how it will devise this system. The bill bars the State Board of Education from emphasizing student achievement when it establishes this accountability system. It limits the measures of actual school effectiveness, such as student achievement and graduation rates, to only 65% of a school’s accountability rating. The bill instead favors factors such as teacher satisfaction, small class sizes, low teacher-to-student ratios, and a healthy and supportive school culture. Such a low accountability rating makes it more difficult to actually identify schools that are failing. Not only that, but with this bill’s passage, Maryland will have the weakest accountability system in the entire country. Maryland could be risking over $248 million per year if these low accountability standards are found to be out of compliance with federal standards. The most troubling aspect of this bill is that it traps children in failing schools. The bill not only makes it harder to identify failing schools by weakening standards, it also ties the hands of the State Board of Education when it comes to taking measures to get failing schools on track. Students in failing schools are trapped in those failing schools for three years before the State and local school districts are permitted to intervene. We have a Constitutional and moral obligation to provide a quality education for every child in our state, regardless of their zip code. The pattern of allowing children to languish in failing schools for year after year as the powerful teacher’s union continue to protect bad schools and put up smoke screens like HB 978 must end. The bill passed the House and Senate, but Governor Hogan has promised to veto the bill. 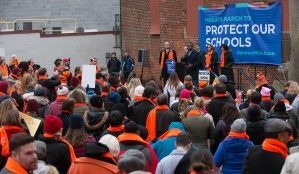 Protect Our Schools … From What? Democrats in the General Assembly moved this week to send Gov. Larry Hogan a bill he has vowed to veto that would restrict the state Board of Education’s authority to craft a school accountability plan under the federal government’s Every Student Succeeds Act. They call it a necessary measure to prevent the Donald Trump/Betsy DeVos privatization agenda from taking hold in Maryland. Governor Hogan calls it a massive over-reach by the legislature that could jeopardize hundreds of millions of dollars in federal education funding while leaving thousands of kids in failing schools. In truth, it’s neither as disastrous as the governor suggests nor as necessary as legislators claim. But we agree with Mr. Hogan that it represents more direct meddling by the General Assembly into the state school board’s business than is wise. 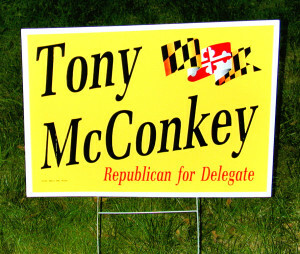 The legislature does have the authority under the state constitution to promulgate educational policy, but it has long vested substantial latitude to do so in the state superintendent and board of education, with the effect that schools have been far more insulated from politics in Maryland than they are in other states. That is not a tradition we should abandon. The legislation, called the Protect our Schools Act, does two main things. First it specifies what factors should be considered in the state’s school accountability system and what weights should be afforded them. Under ESSA, states are required to consider a wider variety of factors than under its predecessor, No Child Left Behind, including measures of both academic achievement and student growth and also school quality measures like the availability of AP classes, the presence of highly qualified teachers and the results of school climate surveys. The state board of education developed a draft policy after dozens of meetings with stakeholders, surveys, committee hearings and other efforts to gather and evaluate input, and it planned at least two more drafts before submitting its proposal to the federal government this summer. The legislature is seeking to override that, in part by assigning less weight to achievement measures than the board proposed (though the final version of the bill upped their share to 65 percent of the final score rather than the original 55 percent). That’s what caused the Hogan administration to warn that the bill could put federal funding at risk; Obama administration regulations required that the academic factors be weighted significantly more heavily than the school quality measures. The non-partisan Department of Legislative Services also warned of the possible loss of funds. But that point may be moot; this month, Congress passed resolutions rejecting the Obama administration regulations, and President Trump has signed them. It now appears likely that states will have substantially more latitude to develop systems as they see fit. That may not be a good thing in the grand scheme of things, but it does suggest that Maryland’s federal funds are safe — from this threat, at least. The second major impact of the bill is to restrict how the state could intervene in failing schools. Among other things, it prohibits establishing a state-wide “recovery district” for failing schools, creating a school without the approval of the local board, converting a school to a charter, using vouchers or some other means to send public school students to private schools or contracting with a for-profit educational company. But the state board can’t actually do those things without the legislature’s approval anyway. It could include them in the accountability plan it sends to the federal government — indeed, Governor Hogan sent a letter to the board encouraging it to adopt some of them — but it couldn’t actually put them in practice without the legislature’s approval. Lawmakers worry that if those measures are in the plan, the federal government could hold Maryland accountable for not following through, but given the move by Republicans in Congress and the Trump administration to provide more leeway to the states, that doesn’t seem likely. Proponents of the bill say they are merely setting up “guardrails” to prevent the school board from going too far off course in its implementation of ESSA, but at least in some regards, the legislation actually amounts to guide rails prescribing where to go, sometimes in questionable directions. To be sure, the General Assembly put substantial effort into considering issues related to this bill, but it pales in comparison to the outreach, research and deliberation the state board has invested in it. Legislators can and should offer input into the process, just as Governor Hogan has, but ultimately, we should leave the decision in the hands of an independent school board. We support Governor Hogan’s veto. AMONG THE factors that have helped Maryland develop a national reputation for its education system is the authority the State Board of Education enjoys to set policy and make decisions that best serve student interests without political interference. Sadly, that may soon become a thing of the past. The General Assembly is set to gut the board’s power to establish key educational standards in a move that threatens to cripple efforts for further school improvement. At issue is legislation that would tie the hands of the state board as it devises a new accountability system for school performance, which is required under the Every Student Succeeds Act federal education law. Under the proposal, the board would be barred from emphasizing student achievement. Among the restrictions being advanced by lawmakers: limiting measures of actual school effectiveness (student achievement, student growth and graduation) to 55 percent of a school’s accountability rating, in favor of factors such as teacher satisfaction; forbidding easy-to-understand letter grades for schools; and barring the state from taking significant actions to reform the worst-performing schools, even after districts have had years to set them straight. Put bluntly, if this legislation becomes law, the state board won’t be able to prioritize student learning or be clear about school performance or do meaningful things when schools fail. That may serve the interests of the teachers unions, which predictably have been the main pushers of this legislation, but it would not help students, particularly those — minority and low-income — who lag behind their more affluent counterparts. The legislation, House Bill 978 and Senate Bill 871, is moving quickly through the legislature, and is seen as having a good chance of winning final approval. Gov. Larry Hogan (R) has vowed to veto the measure, but unfortunately there may be sufficient votes in the Democratic-controlled General Assembly for a successful override. Lawmakers need to put aside their partisan animus toward the governor as well as their obeisance to the teachers unions and realize the damage that this ill-conceived proposal poses for the state and its schoolchildren. For a good example of placing student interests first, they should look to the neighboring District of Columbia, where the State Board of Education this week approved an accountability plan that emphasizes rigor and transparency. The Maryland board is in the midst of a fact-finding effort, including getting input from a variety of experts and stakeholders, to help it determine the contours of Maryland’s accountability system. It should be allowed to do so — unimpeded and unhindered. If not, the reputation Maryland will earn will be as a national leader in de-prioritizing student achievement and success.